A Huntly couple who raised more than 70 children had been living without power and caring for their chronically ill nine-year-old girl, Etera, when they were referred to Habitat for Humanity. 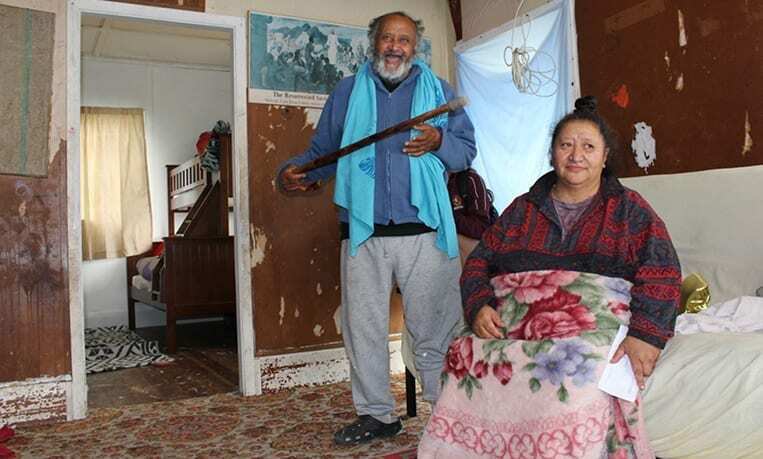 When Habitat met homeowners, kohanga reo caregiver Pauline (59) and kohanga reo kaumatua Shepherd (69) Tuakura, also well-known Huntly carers, they’d had no power for more than two years after the installation of a new electricity transformer outside their property. Pauline said the wiring in the house “blew with a bang”. They couldn’t afford to repair it. Shepherd (from Aitutaki in the Cook Islands) and Pauline (Tainui) were both raised with knowledge of how to “live off the land” and without power, so they simply carried on. This meant preparing meals on gas cookers outside. During winter the house was freezing, and the large whanau slept together in the lounge and garage, on mattresses on the floor. There was no hot water. The couple have been Nanna and Papa to more than 70 children since the 1970s – many since birth. Their lifetime commitment to caring for children began after they set up a Polynesian club, teaching local children hula, kapa haka, martial arts and traditional music. They also raised funds to provide meals for local street kids. Their home was filled with dancing and music, and Pauline, who has a master’s in education, said a lot of the children simply refused to go home – sometimes they’d hide in the orchard out the back. Everyone knew Pauline and Shepherd loved and looked after the kids well. And that extended to a no-questions approach when they were asked to take children in. Pauline described how two babies were once left on her doorstep. Their whanau home is heavy with memories and writing on the walls from all the children the couple have raised, especially one of their daughters Etera (9), who had been with them since she was a baby. Etera often missed school and was in hospital because of chronic asthma and rheumatic fever. Because of this, the Waikato District Health Board’s Whare Ora programme heard about the whanau’s lack of electricity, and got in touch with Habitat to see if the charity could help through its home repair programme. Sadly, Etera passed away in December 2015, before the work began. Habitat for Humanity Central North Island construction manager Nathan Collins described the day he first visited the Tuakara’s home, with contractor and local Habitat supporter Brett Goddard, from Alpha Electrical. After providing information about income, debt and proving a willingness to ‘partner’ with the charity, the family was approved for Habitat’s home repair programme for low income homeowners. It allows for critical repairs and necessary maintenance up to the value of $20,000, with no-interest repayments made over up to five years. Nathan said things quickly gained momentum once the electrical work was done – initially rewiring the house, installing a new stove, range-hood and heat-pump. At the same time, Habitat was working with Waikato Diocesan School for Girls as part of a social justice unit in the social studies curriculum. Linking them with a project at the Tuakara’s home made “good sense”, according to Nathan, and so Habitat arranged for the exterior to be repainted, using paint donated by Dulux, and the 100-plus students doing a lot of the work, in shifts. Pauline, who is partially deaf and struggles with fluid in her chest, said her and Shepherd, who also has poor health, were “blessed” that Habitat and volunteers had helped the family. She also said they were still grieving the loss of Etera. After a lifetime caring for children, it’s unlikely the Tuakaras will retire any time soon – Pauline said they’re expecting two more later in the year. Pauline is unwittingly following in her own foster ‘grandmother’ Rahera Hautana Tukiri Awa footsteps, who raised her alongside many other children, and who she inherited their home from. Pauline likens Habitat for Humanity to having the values of her grandmother’s generation. Home repair work to be repaid by the whanau: Total rewiring of the house (8 double power points, 13 lights, 1 hot water connection, 1 freestanding oven and extractor fan, internal switchboard, external meter box, inspection and connection, supply and installation of heat pump) by Alpha Electrical, and repairs to the exterior cladding of the house. Repaint of the exterior, with volunteers from Waikato Diocesan School for Girls, paint donated by Dulux, tools and supplies donated by Habitat CNI. Big declutter and clean-out by the whanau, with support from Habitat CNI and Waikato Diocesan School for Girls. Rebuild of front fence – labour donated by Habitat CNI and Waikato Diocesan School for Girls. Four sets of double bunk beds provided by the Waikato DHB’s Whare Ora programme.